So you have a flac file and at the time there was no cover art associate to it and now that you have found it you would like to add it. In this post we will show you how to do the changes from the command line and using Mp3tag (GUI). Linux: All distributions have Flac available no download needed. After downloading the zip file just extract the file to a location of your choice. In the zip extraction there will be 32 bit and 64 bit versions. Now we can download and install Mp3tag from https://www.mp3tag.de/download.html. 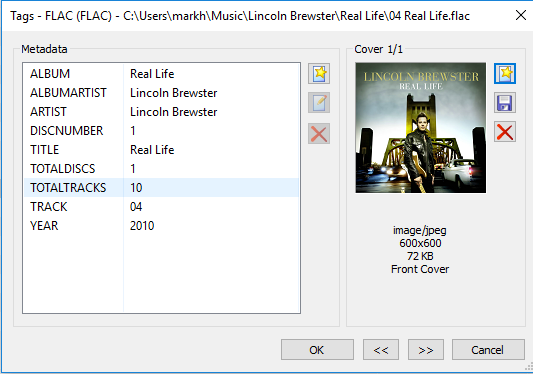 We are ready to edit the flac files metadata to embed the cover art image. When you install FLAC on your system you will also get metaflac installed. This the command line tool we will use to add the covert art into the flac file. metaflac --import-picture-from="&lt;image path&gt;" "&lt;FLAC path&gt;"
Assuming you have the cover art downloaded and in the same directory you can use metaflac to edit the data. If you do not have the cover art just use your favorite search engine and download the image to the directory. 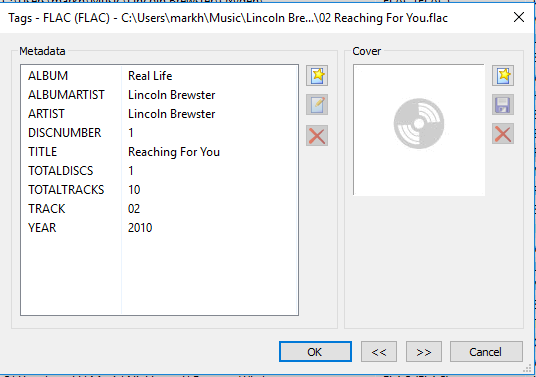 c:\Utils\flac\metaflac.exe --import-picture-from="lincolnbrewsterreallife.jpg" "01 Best Days.flac"
The beauty about using Mp3tag is that we can do many editsd at once and not one at a time like using metaflac. Open Mp3tag and open the directory where the files are located. Right click on the file to edit and click Extended Tags. Click on the icon next to cover art and browse to the cover art image and select, click OK and OK again and edit is done. And that is all to it!